Elie Saab burst onto the fragrance scene in a blaze of golden glory. His debut perfume ‘Le Parfum‘ was penned by none other than industry veteran, Francis Kurkdjian and it presented a radiant woody floral that utilised a solar orange blossom note to capture the unending beauty of Saab’s couture. This perfume kick-started a genre of radiant, glowing fragrances such as Carven’s Le Parfum (also by Kurkdjian) that now permeate the department store shelves, and it has deservedly found quite a following and spawned a number of flankers. This year, Elie Saab and Francis Kurkdjian have teamed up once again to do something new – specifically to release a more exclusive collection of unisex fragrances entitled ‘La Collection des Essences’. Consisting of four perfumes, Essence Nº1: Rose, Essence Nº2: Gardenia, Essence Nº3: Ambre and Essence Nº4: Oud, the collection has been created to showcase “perfumed expressions of haute couture”, and unlike many exclusive collections (most of which are yawn-worthy and blatant money spinners), this one does exactly what it sets out to do with four fragrances that certainly capture the spirit of ‘Eau de Couture’. I have managed to try the whole collection and I must say that I am impressed, as I expected to be – I am, after all, a bit of Kurkdjian fan-boy. The Gardenia is a sharp, green and fuzzy take on the flower that sits somewhere between photorealism and abstraction, whereas the Ambre is a spicy, cosy and piquant amber, in a similar vein to Byredo’s 1996, and the Oud avoids the typical rose/super-spicy cliches as a woody and animalic oud that wouldn’t feel entirely out of place within Kurkdjian’s own collection. It is the Rose however, that has me hooked with its beautiful gourmand tones, that really are quite striking, despite their simplicity. Swiss perfumer, Vero Kern does not make perfumes – she crafts olfactory characters. Her extraordinary perfume line, ‘Vero Profumo’, is built on these perfumed personas and consists of; Rubj – the dramatic, yet distant actress, Onda – the stoic matriarch, Kiki – the flirtatious Parisienne, and Mito – the stone nymph that comes alive at night. 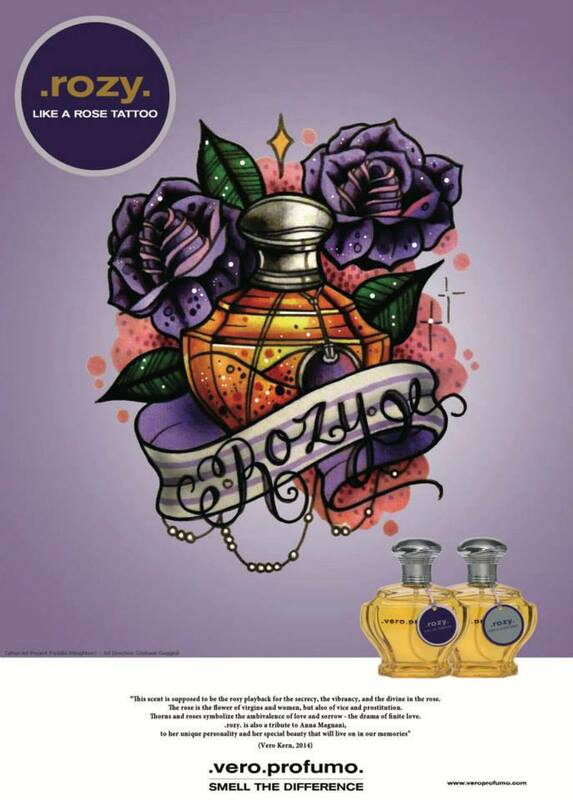 But what of Rozy, the latest addition to Vero’s wardrobe of olfactory personalities? Well Rozy, is the bad girl – a tattooed biker chick with a rebellious soul. Taking inspiration from Italian actress Anna Magnani’s performance in the Tennesse Williams-adapted film ‘The Rose Tattoo’, Rozy is the most unconventional of rose perfumes that showcases a darker, and altogether more daring side of one of perfumery’s most beloved flowers. In both its Voile d’Extrait and Eau de Parfum concentrations, this latest addition to the remarkable Vero Profumo collection is, as expected, a striking, complex and bold character. 2014 is quickly become the year of the rose for me. It all started with the fabulous (and addictive) Tobacco Rose by soon-to-be-launched perfume house Papillon Perfumery and quickly spiralled into many days absorbed in clouds of Montale’s Black Aoud and a thirsty hunt for more roses. 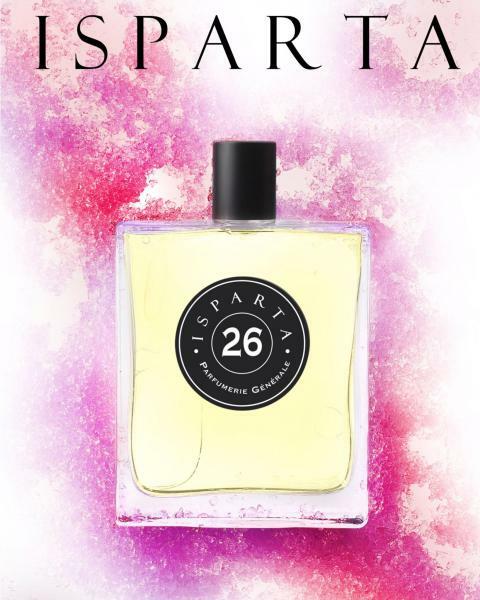 Nothing can satiate my appetite when I’m on a mission, so it was with much interest that I approached Isparta PG26 (hereafter referred to simply as ‘Isparta’) – the new rose fragrance from Parfumerie Générale. Now Parfumerie Générale and I have a complex relationship. Don’t get me wrong, I have great respect for the brand and Pierre Guillaume as a perfumer, but nothing from the line has bowled me over yet (Djhénne has come VERY close – I really should invest in a bottle but something holds me back) and I want so desperately to love something with PG’s intriguing gourmand signature. I have definitely tried Balenciaga’s Florabotanica but for the life of me I cannot remember how I felt about it. The bottle is gorgeous so I’m pretty sure that I recall being impressed to some degree, but that’s about as far as my recollection goes. Perhaps I was put off by spokesfaceperson Kristen Stewart (there really is only so much of her looking bored that I can take) or maybe the scent was nice but nothing noteworthy (that sounds more like it). Whatever the reasons, Florabotanica failed to make an impression. Florabotanica’s first flanker ‘Rosabotanica‘ however (we’re going to get a whole slew of these aren’t we? I reckon it’ll be ‘Jasmabotanica’ next), is definitely more memorable and noteworthy and comes as a complete surprise for a brand that always makes high quality stuff but doesn’t always push the boat out artistically speaking. Rosabotanica certainly changes the game in that respect. Launched in late 2013, Rosabotanica was created by perfumers Olivier Polge (Florabotanica, Dior Homme and Viktor & Rolf’s Spicebomb) and Jean-Christophe Hérault (Florabotanica and Comme des Garçons’ Amazingreen) as “the second flower in Balenciaga’s magical garden”. ‘Magical’ is indeed the right word for it as this second botanical scent takes the idea of flowers into unique, unusual and positively futuristic territory. So if you’re just recovering from Christmas Day and New Year (personally, I’m still trying to shed that darn turkey-weight) you’ll be shocked to know that Valentine’s Day is just around the corner. That’s right, you blinked and missed January so now it’s time to think about showering that special someone in your life with lots of lovely gifts to say those important three words. Of course you don’t have to give gifts to say “I love you” and you don’t need one special day in the year to do so – I for one try to make an effort to profess my undying adoration for my beau at least once a day (normally just after I’ve been served dinner). But if you’re looking for a little token for your love, then what better way to show your love than with the gift of perfume? 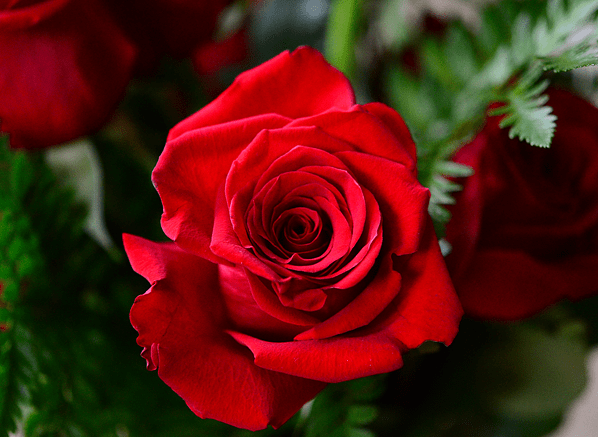 Roses are the traditional flower to gift on the day of Saint Valentine, so for my Escentual column this week I have pieced together a veritable bouquet of beautiful rose scents for you to give as lovely fragrant gifts. They range from the straight-up photorealistic rose to the hedonistic oriental rose via a brief stop at the raunchy bedroom rose. So, please click here to head on over to the Escentual blog and read ‘A Gift of Roses’. 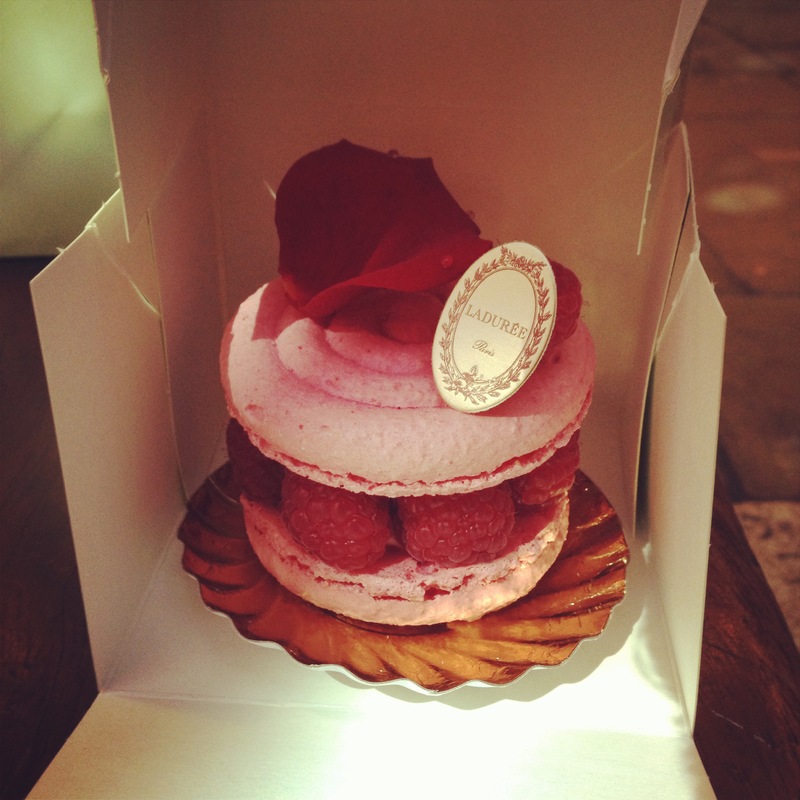 Ladurée’s Ispahan – The best damn thing I’ve ever eaten! Inspiration can come along at the oddest of moments and often in the most surprising of guises. This is why I currently sit on a train whizzing home from London and feel the need to whip out my iPad and start writing a post about my day. A little self-indulgent? Perhaps but in the spirit of ‘sharing the joy’ I’ve had the urge to write about the sensory pleasures of the day. Today, having finished work early, I took myself off to The Big Smoke on a ‘treat yo’ self day’, during which I pottered around the Isabella Blow exhibition at Somerset House, visited one or two of my usual fragrant haunts and took myself for some much earned sugar at Ladurée, before attending a Perfume Lovers London talk in the evening. And why not? I’ve been working very hard over the last couple of weeks so a little sensory R&R is surely deserved. The main event was of course the food and it will come as no surprise to those who know me that I have spent the last few weeks ogling images of Ladurée treats on the internet. There is just something about the pastel shades of smooth macaron shells and the vivid sight of pastries overdosed with fruit that sends my mouth, stomach and brain whirling towards sensory overdose. By Kilian – the brainchild of cognac heir Kilian Hennessy – launched as a brand in 2007. Hennessy’s first collection, wonderfully entitled ‘L’Oeuvre Noire’, was an impressive outfit, consisting of rich, decadent and expertly created fragrances. Since then, By Kilian has been relatively prolific with its output, releasing a number of fragrances under its ‘Arabian Nights’, ‘Asian Tales and ‘In the Garden of Good and Evil’ collections. Comparing the fragrance within these latter collection to those found in L’Oeuvre Noire leads one to question what happened to the brand. The more recent offerings have failed to capture the hedonistic magic of those initial fragrances, with none of the newer offerings being even remotely comparable to the photorealistic tuberose of Beyond Love, the film noir honey of Back to Black or rich, pink delicacy of Love. This year By Kilian has added two new fragrances to its collection; Musk Oud and Playing with the Devil. Both are polar opposites in style, proving that as far as creative direction goes, Hennessy definitely understands and enjoys variety. On the downside however, they also show a continuing ‘watering down’ of ideas within the brand and when looking back at what By Kilian has brought to the table before, this feels very sad indeed.